As I finished this painting last week, I was reminded of a nice day this past fall. 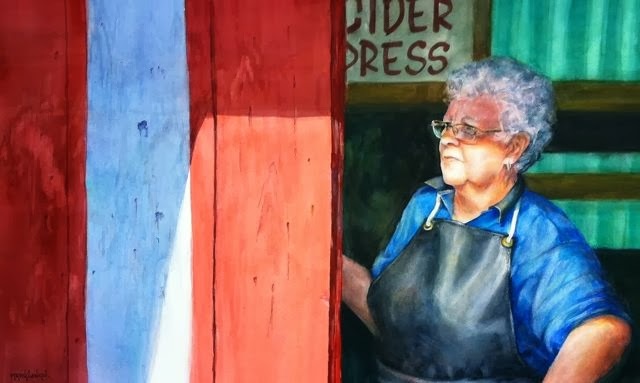 I spent an afternoon at a local cider press to do some "painting" research. It was a busy day at the press. People that waited to have their apples pressed shared stories about gardens, seasons and families. For me it was a chance to slow down and appreciate these seasonal traditions. This is a family run cider press and they all work together with a comfortable ease. At first I thought I would do a painting about the men that work there. But as I watched and photographed the workers, I saw that the real energy came from Sally. She went from job to job seamlessly and was welcoming to all. I am sure that is why the cider press has her name on it!